Charter schools across the country enroll smaller percentages of disabled children than traditional public schools, according to a new report based on federal data. But although charters have traditionally lagged in special needs enrollment, they are catching up to their traditional counterparts, the authors write. The report, written by Lauren Morando Rhim and Shaini Kothari of the National Center for Special Education in Charter Schools, compares figures on both district and charter schools from the Department of Education’s Civil Rights Data Collection. Conducted regularly for the past 50 years, the CRDC collects information on student enrollment and educational programs from more than 96,000 American K-12 schools, including more than 6,000 charter schools. This study is based on data from the 2013–14 school year. Nationwide, the average enrollment of public school students eligible for services under the Individuals with Disabilities Education Act was 12.52 percent in 2013–14, an increase of .05 percentage points since 2011–12. A disabled-enrollment gap persists between the traditional and charter sectors, however. Disabled children — whose challenges may range from blindness to ADHD to Down syndrome — make up 12.46 percent of all students at traditional public schools, but just 10.62 percent of students at charter schools. That gap has been observed in the data since at least 2008. Notably, though, the disparity has slowly been closing with the passage of time. It stood at 3.6 percentage points in the 2008–09 school year but had decreased by half, to just 1.84 percentage points, five years later. 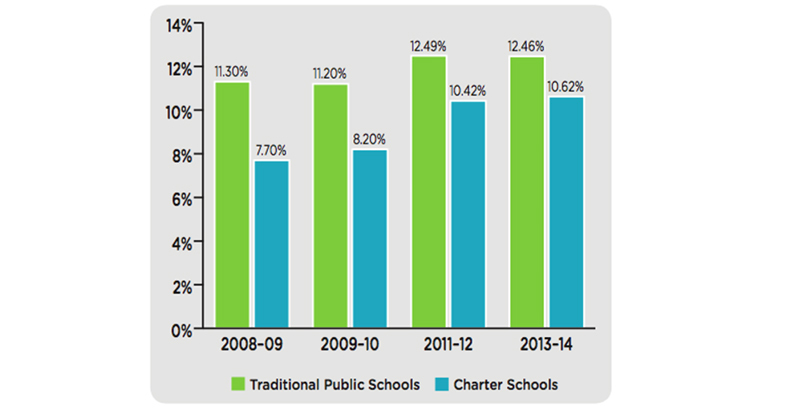 The diminishing gap comes as both charters and traditional schools have enrolled higher proportions of disabled students in recent years. National trends are also reflected in individual states, they add. Although state policy guides disabled identification generally, such that Maine enrolls the highest proportions of disabled students in both district (16.7 percent) and charter schools (25.3 percent) and Texas enrolls the lowests in both sectors (8.7 percent and 7.1 percent, respectively), traditional public schools in almost every state tend to enroll slightly higher numbers of disabled students than charters. The only states where this is not the case are those with small charter sectors, like Maine, New Hampshire, and Iowa. 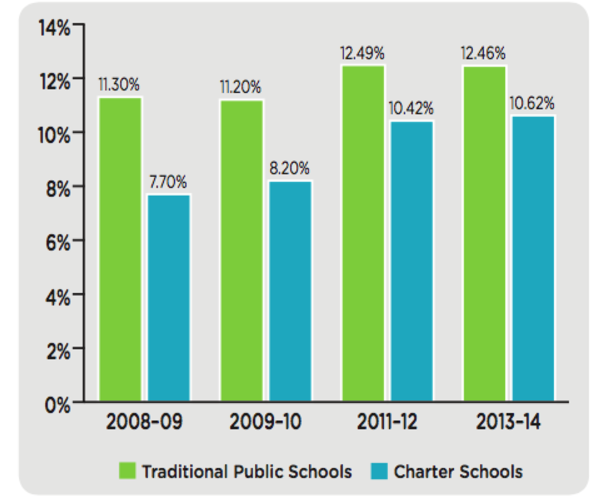 • While they still enroll proportionately fewer disabled students overall, charter schools have proven better at including them in typical classroom settings. Fully 84.3 percent of disabled students in charter schools spend more than four-fifths of the day in general education classrooms, compared with 68 percent of those enrolled in traditional schools. And while just 5 percent of disabled charter students spent less than 39 percent of their day in general education, more than double that percentage — 11.8 percent — of disabled learners in traditional public schools did. • That difference in inclusion could be due to the differences in disabled students enrolled in the two sectors. Charter schools tend to enroll higher percentages of students with autism and emotional disturbances, while traditional public schools enroll higher percentages of kids with more serious cognitive disabilities. Just 17 percent of students in the latter group spend more than 80 percent of their school day in general education classrooms, according to the Department of Education. • Charter schools suspend their disabled students at a slightly higher rate than traditional public schools (12.3 percent versus 11.6 percent). Both sectors suspended those students at lower rates in 2013–14 than they did in 2011–12. For both charters and traditional schools, disabled students were hardly ever expelled.